Kilala bilang Sto. Ang Kulago ng Guiuan, Silangang Samar, ang kakaibang rebulto na ito ay kumakatawan sa relihiyosong pagkakasundo sa pagitan ng Kristiyanismo at ng katutubong paniniwala ng mga katutubo. Bago ang pagdating ng Espanyol, ang mga kuwago ay pinarangalan bilang mga diyos o natatakot bilang mga pahayag ng kasawian. Ipinapalagay na sinuman ang gumawa nito na pinagsama ang kanyang mga paniniwala sa animist kasama ng Kristiyanismo. Certain beliefs and imagery scared to the pagan terrace farmers in these mountains originated in the Philippine lowland or even overseas millennially distant in time. A fearful reverence for owls is one such tenet of the mountaineers' paganism. In Ifugao these gnomish and unnerving birds have been venerated graphically by carving their heart-shaped facial outline on some of the tribal granary deities (Bulol). In Ifugao, as elsewhere in the Philippines, the night cry of the owl near someones home portends the imminent illness or death of someone in the family or the vicinity. In one know Philippine lowland location the owl; from the prehispanic era until a few years ago; reigned as a God, one whose centuries' old image as alighted here before you in the form of a disturbing creature known as the Santo Kulago of the Guiuan; the owl saint of Guiuan. 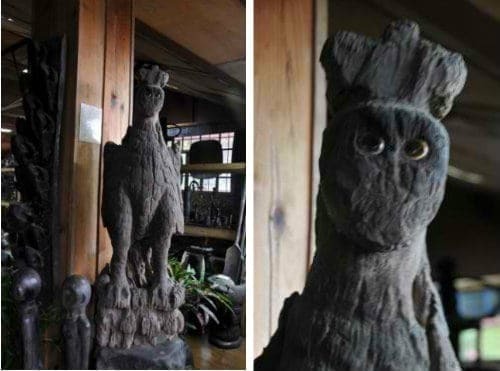 Carved in that Eastern Samar City some 1400 kilometers southeast of Ifugao; Early in the Spanish epoch; of Molave, one of the hardest of native woods, the statue bears the feathered body of an owl combined with a much eroded human face and head, crowned blasphemously with a christian cross. It is an easy presumption that the carver had converted from Animism to Catholicism, but tepidly. He, as do a majority of Ifugao today, thought it political to practice a divided loyality, half animist and half christian. But he, alone with the cult that grew around this idol and carried on its Dionysian celebrations, kept all of this secret fromt eh resident Padres (priests) during the "Spanish time". The cult remained populous and joyful until one year in the 1980's when two children the Owl Saint's flock died from an unknown illness. The bird was thought to have been the cause as a punishment for some offense to it. Caution: Think kindly of the Santo Kulago of Guiuan; since he or she reads thoughts no doubt. Where to stay in Eastern Samar? Will you dare to visit and see it in person? Share your thoughts below.